At home, work and play we need to be creative and positive if want to make great changes in our life. 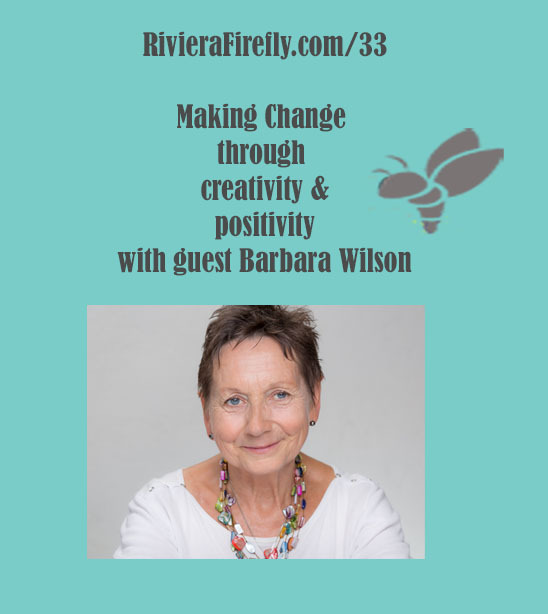 Firefly is thrilled to have had this great chat with our guest Barbara Wilson Executive Creative coach, leadership and personal development facilitator. Barbara Wilson is offering listeners a Free MOT for your business ? a downloadable Workbook PDF entrepreneurs and individuals “Reviewing , Reflecting and renewing your self for the Future ending with visualisation and a storyboard” . Find out how to get this for free. Barbara Wilson shares her business journey and life path to the South of France. Issues that a coach can help you with and how to choose your coach. Thinking out of the box, changing your mindset. Yes And! instead of Yes But!